CasinoBonusNews → Casinos → "Golden Riviera Casino"
The calming effect of the Golden Riviera Casino’s main page exists to give gamblers a sense of security and enchantment. Players from around the world may want to try out the online casino simply because of the air of calm authority and luxury this Web site provides. There are plenty of other reasons to check out the casino, though. These reasons include the tried and true Microgaming software that provides the games, the security that comes from being audited by eCogra and feeling of knowing your online casino has been running since 2001. Looking further, players can see from the details of the promotional offers and the extras like the live tournaments that this is a casino that plans for the long-term rather than the quick buck. To reel in new players, Golden Riviera uses a couple of very big hooks. One is a no deposit free play promotion where players can use the $2,500 they are given to play games in the casino for one hour without putting their own money into a single game. The player must make at least 20 bets using the free money and they cannot claim any of their winnings until they have made at least one deposit. Those who win with this promotion are not able to claim the other new player promotion that the casino offers, but those who have not been lucky enough to win a prize here can move on to the three-tiered deposit bonus. Here, new players are able to earn up to $500 in bonus money over their course of their first three deposits. This bonus cash must be played through 30 times before any winnings can be withdrawn, and while all games in the casino can be played, bets made on slots and parlor games count 100 percent of the wager to the playthrough amount. 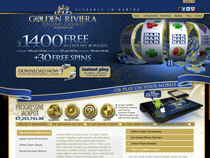 Golden Riviera advertises having more than 600 slot machines to choose from. Sitting down to count them might be counterproductive, though, as a player’s time would be better spent actually playing them. The casino hosts traditional slot machines, five-reel video slots, progressive jackpot machines and MegaSpin slots, which are just like playing two or more machines at the same time. The casino also has a good assortment for table game fans as well. 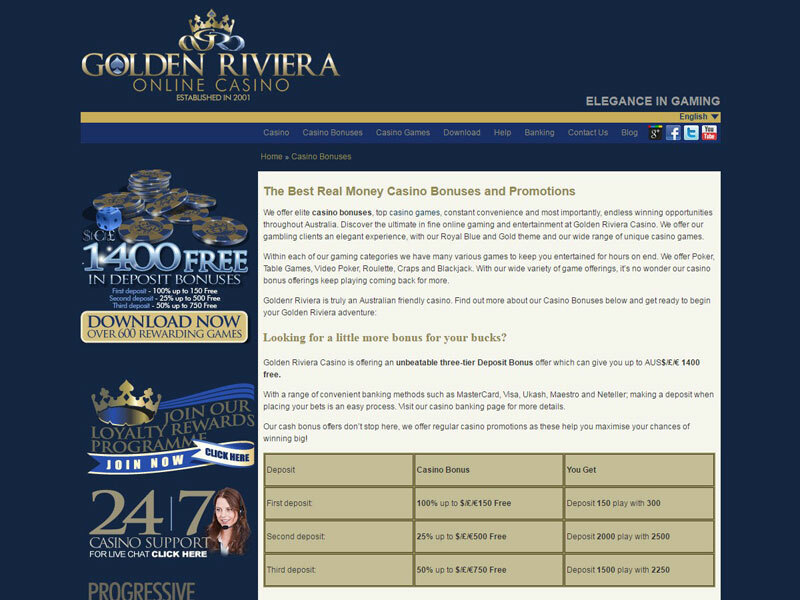 The norm for online casinos seems to be offering many variations on the game of blackjack, and Golden Riviera is not going to be left behind in that trend. Blackjack, roulette, craps, video poker and baccarat surround the player so that anyone can get lost in the virtual casino floor looking for the ultimate game and the best bet. Players new to the casino can start with play chips before graduating to the real money games if it makes them more comfortable. No matter where you are in the world as long as the casino accepts players from your country, the cashier will accept payments in your currency. 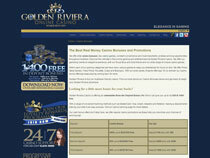 Golden Rivera has more than 30 ways for gamblers to get money into an account. This includes credit cards, debit cards, ECO cards, PaySafe cards, uKash, eKonto, Click2Pay, InstaDebit, Poli, wire transfers, GiroPay and Skrill among others. While people residing within the United States are not able to play, the casino still accepts U.S. dollars as well as Canadian and Australian dollars, euros, pounds, yen, pesos and other South American currencies. While the Web site does an excellent job explaining all the rules as far as banking, promotions and accounts are concerned, sometimes players still need to talk to a customer service representative. Support is available 24 hours a day through chat, email or telephone.